I love ice cream. I think I must have inherited my love of ice cream from my maternal grandfather. I remember when I was a kid, there was always ice cream in grandpa's freezer. I don't usually keep ice cream in the house because if it's there, I'll eat it so I just buy it occasionally. My three favorites are Godiva Belgian Dark Chocolate, Haagen Dazs Strawberry and Ben & Jerry's Phish Food. The first two don't really need any further explanation but the third one probably does. Phish Food is chocolate ice cream with dark chocolate fish and swirls of marshmallow and carmel. I can't really pick one favorite from these three. They're all delicious. I was at my local Dierbergs on Saturday when a new flavor of Ben & Jerry's caught my eye...Black & Tan. A Black & Tan is a style of beer where stout is layered on top of a pale ale. Here in the US, it's usually Bass on bottom and Guinness on top. A good bartender knows how to pour the beers so that the two do not mix. As for ice cream, I have seen recipes for stout ice cream but I have never made or tasted it. When I saw this new flavor of Ben & Jerry's, I just had to take a second look. Sure enough, the flavor was described as being "cream stout ice cream swirled with chocolate ice cream." Stout and chocolate...hey, what could be better than that. There's probably no beer in the ice cream but it definitely tastes like stout. My list of favorite ice creams has just increased by one! It's Daryl Dragon's 64th birthday today. Daryl Dragon is the Captain of Captain & Tennille. Be sure to check out the post on Toni's blog today. It's cute. I can't imagine the "Love Will Keep Us Together" couple ever arguing though. This is one of my favorite pictures of Daryl. It was taken by my dad on September 10, 1978 at the Mississippi River Festival at SIU Edwardsville. It was the first time I had seen Toni & Daryl in person and I was in complete awe for the entire concert. We had seats in the second row right in the center. Is it really possible that this was almost 28 years ago? Oh my gosh, Daryl was only 36 at the time; 8 years younger than I am right now. OK, now I feel old...hee hee hee. Plumeria...one of the prettiest and most fragrant flowers I know. We bought this plumeria plant about 10 years ago at a Home & Garden show here in St. Louis. It was just a stick and I planted it in a pot of sandy soil, watered it sparingly and, sure enough, it sprouted leaves. It took about 3 years before flowers appeared. Who knew you could grow this beautiful tropical flower in the midwest. I bring the plant inside once the temperature drops below 50 degrees outside and it lives in the basement until Spring. It drops all of it's leaves and once again becomes merely a stick in a pot. When were were in Hawaii 5 years ago, we bought another plumeria "stick" and it survived the nearly 5000 mile journey home. This one has light pink flowers. It has not bloomed yet this year but I'm hoping that it will soon. 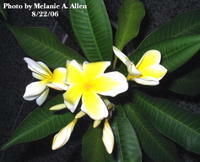 The plumeria, although not native to Hawaii, is the most common flower found there. Most people will recognize it as being the flower used in Hawaiian leis. I'm counting the days, make that hours, until I'm wearing one of those leis. I think I'll need to bring home another plumeria "stick" to add to my collection. After almost two months of Friday night Muny performances, it felt so strange not to come home from work last night, grab the seat cushions and frozen sodas and head to the Muny. We haven't been at home for the past 8 Fridays nights...seven Muny shows and one Cardinal/Dodger game on the Muny "off" week. Normally, we go out to dinner nearly every Friday night but we decided to stay home and BBQ and just relax. We grilled marinated flank steak, asparagus and sweet potatoes. Yum! After dinner, I worked on creating some Artist Trading Cards (ATC's). I'll explain more about these cute little "works of art" in another post. We're going to dinner tonight with my sister and brother-in-law. We suggested Mosaic since they've never been and it's a really fun place. You can spend hours there trying the various "small plates." I've been making a few cards for upcoming birthdays of fellow coworkers. Since this card is for an October birthday, I wanted to use warm, rich colors that remind me of fall. I love the More Mustard, Perfect Plum and Ruby Red colors together and I think they evoke feelings of cool fall days. 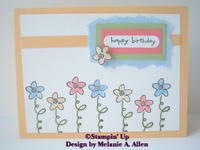 I used the Linen background stamp for, what else, the background and I used the Simply Said set for the focal image. I stamped a flower from the same set, cut it out and mounted on the corner of the Ruby Red card stock. I have decided that faux stitching works well with this set. I seem to be on a faux stitching kick lately and I love to find reasons to use this technique. When I finished this card, or thought I had, I realized that it still needed something else so I added eyelets in the corners and Dazzling Diamonds to the edges of the flower. I honestly try to resist using sparkle but I'm never successful. Sponsored by Pop-Tarts...that cracks me up. I'm not sure why, but it just does. Anyway, we went to the concert last night and it was great. I enjoyed seeing everyone in person. They can all really sing. Miss Diva (aka Katherine) or Ill Diva as I've seen her referred to on another blog, was under doctor's orders to sing only two songs due to her "bruised vocal chords." Poor thing. Actually, she does have a very pretty voice. I just have a hard time with the diva personality. Anyway, everyone was great. Bucky wasn't there due to illness but I didn't really miss him. Nothing personal but I just don't care for his style (country). Taylor and Chris are still my favorites! We ate dinner at 400 Olive last night for Restaurant Week. 400 Olive is an "urban grille" that won the 2005 Riverfront Times Readers Choice Award for Best New Restaurant. I can definitely see why. The food was wonderful. I had the crab cake appetizer, the garlic crusted breast of chicken with Gorgonzola cheese and brandy dijonaisse cream entree and the orange ricotta cheesecake for dessert. Bill had the spicy grilled shrimp appetizer, the petite fillet entree and bread pudding for dessert. After dinner, we walked to the riverfront for Live on the Levee. The band Live performed on the riverfront and we sat on the steps of the Arch. They performed for a little over an hour. I wasn't sure I was going to know any of their songs but it turns out that I knew about 7 or 8 of the songs they performed. They were very good and I think I need to buy some of their albums (OK, even though they are CD's, I still call them albums). There was a spectacular fireworks display afterward. I absolutely love fireworks and could sit and watch for hours. I think it must go back to the days of watching the Shrine Circus fireworks downtown outside Busch Stadium (the original Busch Stadium). I think another reason I like fireworks is because they are sparkly and we all know I love anything sparkly...hee hee hee. 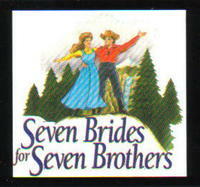 Our final 2006 Muny show last night was Seven Brides for Seven Brothers. We had seen it at the Muny in 1994 and, although I didn't really remember the story, I did remember that there was a lot of dancing. There were two big dance numbers and they were both spectacular. The audience clapped for about a minute after the first one. Anyway, the story is of a man who proposes to a woman within 5 minutes of meeting her. She marries him and goes to his house only to find that he has 6 brothers, all of whom live with him. The plan is to find 6 women for them to marry so that they can leave and start lives of their own. She has 6 friends who happen to fall for all 6 brothers and they all live happily ever after. No crying at this performance...yippee! Next spring, we'll see how many of our choices made it. They also ask for comments or suggestions so I wrote "Toni Tennille would be an excellent choice for Hello Dolly." I tell them each year that they should ask Toni to star in one of the shows. I'm not even sure she'd be interested in doing it but I sure would love it! Speaking of Toni, there is a reference to Captain & Tennille on page two of the August 21 issue of People. Unfortunately it's under a picture of Katie Couric in 1975. The caption reads, "While the Captain & Tennille hit No. 1 with "Love Will Keep Us Together," this short and sassy cheerleader..." blah blah blah. I can't stand Katie Couric but it was fun to see a reference to Toni & Daryl. The Aerosmith tickets went on sale this morning at 10:00am. As soon as the link said "on sale now" we clicked it and bought the best available at the $95 per ticket price. The $95 tickets were sold out within 5 minutes. Amazing! It seems like we either have no plans or 15 things going at once. This weekend starts off with the Muny season finale tomorrow night. Saturday, I have to buy Aerosmith tickets when they go on sale on-line at 10:00am (yes, I love Aerosmith...have you ever heard of an avid Captain & Tennille fan liking Aerosmith?) and then I have to go to the Ink Spot in Kirkwood to pick up my Amuse polka-dot alphabet sets. Saturday evening, we're going to eat dinner at 400 Olive for Restaurant Week. 25 cities are participating including St. Louis, Washington DC, New York, Atalanta, Boston, Chicago, Los Angeles and San Francisco, just to name a few. Sunday evening is the American Idols concert at Savvis Center (woohoo, I get to see Taylor). OK so, in the mean time, here is one of my latest creations. I bought a square and round buckle punch last week and they're just the cutest things! They really add something special to the card and they're so much fun to use. I love the birthday stamp from the Alphabet Soup set and I use it quite often. For the main background, I used the speckled jumbo wheel and I used the linen background stamp on the apricot card stock. The turquoise ribbon was added to give the little buckle something to cling to...hee hee hee. I added sparkled (of course) around the focal image and the buckle. Be sure to click on the photo for a close-up view. I'm still in the process of photographing the cards I've made over the past few weeks. It's sometimes very difficult to get the lighting just right in order to show the correct color, dimension or sparkle. I have successfully photographed most of the latest creations, however, there are still two cards in particular that are not cooperating. The purple card stock on one of the cards turns out blue in the photographs. I think I need different lighting for certain colors to show true. Here is one that looks true to life. This is a birthday card that I sent to my friend, Renee, last week. I used the layout from the sample for this set in the latest Stampin' Up catalog, however, I changed the colors (the colors in the catalog were too dark in my opinion), omitted the ribbon and hardware and added a strip of apricot card stock under the "happy birthday" image. I also added dazzling diamond glitter to the center of the flowers. It was a fun card to create and I really like this stamp set (OK, I like all of my stamp sets...hee hee hee). I spent some time reorganizing my stamping area tonight. I'm a neat freak and I can't stand to have things unorganized or out of place. I had originally planned to do some stamping but got caught up in the organizing process and ran out of time. Oh well, I didn't have any new card creation ideas in my head tonight anyway!